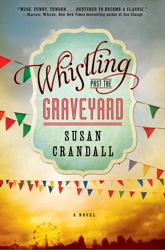 In Susan Crandall’s Whistling Past the Graveyard we take an adventure with Starla, a fiesty nine-year-old girl who runs away from her strict grandmother’s home in 1963 down in Mississippi. Starla’s ultimate goal is to get herself to Nashville, to see her momma who is a famous singer. But seeing as how she’s nine, Starla’s only means of transportation are her feet. That is until she accepts a ride from Eula, a black woman traveling alone with a white baby. This unusual trio makes its way through the south in order to get Starla to her momma. Throughout this road trip, Starla realizes for the first time what life really is and how to reach for her dreams of what life could be like one day. Read the excerpt below and then answer the question in a comment below for your chance to win! I got up the next morning and it looked like Eula had been up all night baking. I bet she’d used up everything in Miss Cyrena’s kitchen that could be made into a pie or cake. And she didn’t even have a single order yet. “What’s this one?” I pointed to a pie that kinda looked like apple, but not. “And that?” I pointed to a round cake with a hole in the middle. I eyed the table. There was lots of things that didn’t look familiar. “We gotta eat ‘em all?” I was all for sweets, but even I couldn’t eat all these, even if I had a week. I nodded. This’d be almost as good as when I got to Nashville and got to make Christmas cookies with Lulu. We spent the rest of the morning making that chess pie. Eula explained to me how you had to use ice water when mixin’ crust. She showed me how to put it in the pie tin and brush it with egg white and prick it with a fork and bake it for a few minutes before adding the filling – which was mostly eggs and sugar, but had cornmeal in it! – to be baked. That made for a nice crisp crust, she said. But it was only for a chess pie. Every pie, it had its own special trick. I wanted to learn them all. Eula was right, baking was soothin’. Too bad baby James was too little to do baking, maybe he wouldn’t cry as much. The baking business in Miss Cyrena’s town turned out to be real good. So good that I didn’t even have time to go out and collect bottles for deposit money. I was a little sorry ‘cause I missed being outside. Me and Eula … I mean Eula and I (Miss Cyrena was real picky about the way we talked in her house; Mamie was too, but I cared what Miss Cyrena thought of me so I tried) we started rolling out pie crust and mixing cake and muffin batters first thing in the morning, even before we ate breakfast. When I bellyached about being hungry, Eula told me I was lucky that Miss Cyrena had a nice new electric mixer or breakfast would be even later. Even though I had to wait for breakfast, I was glad Eula had decided to do baking instead of going to work at people’s houses and whatnot. I could keep my eye on her and know she was safe. Besides, if she hadn’t I might never have found out something about myself. Turned out, taking care of babies wasn’t my only gift. Eula said I got me a special gift for rolling pie crust, too. She only had to show me how to do it once. And then she helped me with my first one by putting her hands over mine and letting me get the feel for how hard to press the rolling pin and how to go this way and that to make the dough a circle. In the four days we’d been baking, I’d only rolled one too thing and had to start over. Eula said that messing with the pie dough – she called it “working” the dough, but I was the one working, so it didn’t make any sense to me – too much made it tough and not nice and flaky, so I was real careful from them on. I wondered, what other gifts I got bottled up inside me? That question had started to gnaw on me some. That Thursday morning, my wondering was bigger than ever. And so was the orders. Folks in Miss Cyrena’s town must eat an extra lot of cake and pie on Friday and Saturday, so Eula said we had to work extra-fast – which made our conversationing time shorter. We wouldn’t get to sit at the table and have a banana and a glass of milk while we waited for a batch to come out of the oven. That was my favorite time of day, me and Eula at the table talking with the timer ticking behind our words. I’d already found out she’d been a maid to three different houses with kids before she switched to baking. When I asked why she changed families (Bess and Ernestine sure had stayed put with their families), she’d got real quiet before she said it was ‘cause she loved them babies too much. She said that was the reason she changed to baking, too; too much baby love. That didn’t make a lick of sense to me, but she got some tears stuck in her eyes, so I didn’t ask any more about it. Even though our conversationing time wasn’t gonna be, I was determined to get my questions asked about my gifts. Just as soon as we had the pie dough getting cold in the Frigidaire and the first cakes in the oven, me and – Eula and I finally got to sit down and eat our grits and eggs and fried bacon. Miss Cyrena said Frosted Flakes was nothing but sugar, and a growing child needed protein. I’d been growing just fine on Frosted Flakes so far, but didn’t argue ‘cause we was guests in her house. She stopped with her coffee cup halfway to her mouth. She shook her head. “Reckon not … none that I know ‘bout anyhow.” She blew on the coffee, then took a sip. “How old were you?” I was wondering if I was late in finding my own gifts, or right on time. I felt a little disappointed. I thought having the gift before I was ten was real special. I swung my bare feet, liking the feel of the linoleum swish, swish, swish with the tick-tick of the timer as I thought. I put a big bit of eggs into my mouth. “How’d you know ‘bout the pies?” I asked. My mouth was full, but Miss Cyrena wasn’t in the room to scold me. I took a bite out of bacon, forgetting that I always saved if for last because it was my favorite. Mamie always made me do the things she wanted me to do, which was never the interesting stuff. Whenever I asked to do something, she said I’d make too much mess, or too much noise, or it was too dangerous, or I’d break something, or people would think I was unladylike, or think I was trashy. Why, if I hadn’t met Eula, I might never have found out about the babies or the pie crust. “How do you know what to try?” I asked. There don’t seem to be enough time to try everything. What if I was trying race-car driving (dangerous, unladylike, and trashy) when my gift was really doctoring animals? I snorted. “you don’t know my mamie.” I realized too late that I wasn’t stickin’ to my story. I held my breath for Eula to say something, but she didn’t even look my way, so I reckon she was so caught up in talkin’ gifts that she missed it. The way she said it got me thinking. Mamie said girls grow up to be secretaries or nurses or teachers and then turn into mommas, and that’s their job for the rest of their life. But my momma was famous for being a singer. She must have tried things that weren’t secretarying or nursing to find out she had a gift. Right then I got a little sick feeling in my belly. She had been a momma … but had to leave to get famous. Do you have to choose one or the other? I sat there finishing my breakfast, feeling around inside to see if my mind got curious about something. Curiosities started snapping like popcorn. If you were to run away one day and leave life as you know it behind, where would you go? What would be your ultimate destination? Answer in a comment below by 5 p.m. on Wednesday, September 25 for your chance to win a copy of WHISTLING PAST THE GRAVEYARD by Susan Crandall! *Fifteen (15) comments will be chosen at random. For complete contest rules, click here. In the summer of 1963, nine-year-old spitfire Starla Claudelle runs away from her strict grandmother's Mississippi home. Starla hasn't seen her momma since she was three--that's when Lulu left for Nashville to become a famous singer. Starla's daddy works on an oil rig in the Gulf, so Mamie, with her tsk-tsk sounds and her bitter refrain of "Lord, give me strength" is the nearest thing to family Starla has. After being put on restriction yet again for her sassy mouth, Starla is caught sneaking out for the Fourth of July parade. She fears Mamie will make good on her threat to send Starla to reform school, so Starla walks to the outskirts of town, and just keeps walking. . . . If she can get to Nashville and find her momma, then all that she promised will come true: Lulu will be a star. Daddy will come to live in Nashville, too. And her family will be whole and perfect. Walking a lonely country road, Starla accepts a ride from Eula, a black woman traveling alone with a white baby. The trio embarks on a road trip that will change Starla's life forever. She sees for the first time life as it really is--as she reaches for a dream of how it could one day be. My goodness, I would go to Nepal! It’s funny- I fell into reading up about it because of a school project when I was thirteen, but when the project ended, I still sought out related books and articles, as though I were just drawn to it. Just to see this ‘untouched’ place that I’ve learned so much about- with these majestic, snowy peaks, or sapphire, mountain lakes. I’d eat daal baat, or meet locals, explore monasteries! I’d want to get a completely new perspective on the world in a place with such a long, deep history, and just try something different. I would run away to Scotland! I love traveling with my husband and Scotland has so many places to explore. A regular vacation has so little time so it would be nice to run away and see the country at a leisurely pace, city by city, visiting castles, distilleries, small towns, ruins, etc. and seeing all of that history!!! I’d teleport myself to Paris, “La Ville-Lumière” and home to the Louvre, Montmartre, Tuileries, Arc de Triomphe, Champs-Élysées, and the Eiffel Tower. With a whirlwind tour of all the major sights, a leisurely cruise along the Seine would have to wait for another occasion, but I’d make time for a cup of café au lait and croissant at a classic sidewalk bistro. I’d run away to a small New England town on the water. I love those small town feels and would want to be on the water. I love just sitting on the beach and looking out into its vastness. I used to dream of walking across the United States and visiting strange and famous attractions like the Toilet Seat Museum and Mount Rushmore. The ultimate destination would be Washington D.C. to explore all the monuments and museums the city has to offer. I’d go to New York. Big city. Lots of entertainment. I would go somewhere warm. Hawaii? Would also love to learn some new languages. Morocco? Martha’s Vineyard, always wanted to go. I would love to run away to Australia and just have salmon/strawberry cheese and fresh fruit and get rid of all the toxin of living in a city for decades! Where would I go? Good question. Californina. San Fransisco. The year round cool temps is an immediate lure. That and it’s about as far away as I can get. But I reserve the right to change my mind. I’d quickly run away to the Outerbanks, NC…love that beachtown. My whole family does in fact, so I guess they would be going with me. I would walk the whole Appalachian Trail, and not be afraid. I am in forensics and nothing scares me more than women hiking alone or even with a boyfriend. Everyone says it can’t happen to me, but it can. I would start in Georgia and make my way North. Camp every night and listen to the woods, where the crickets would sing me a lullaby, and watch the star show every night. I would without a doubt go to London!! Best summer read of 2013. I would love to run away to Hawaii and live by the ocean. I think it would be a very relaxing place to live. I’d go to San Francisco or Seattle for cities that are cool and foggy and have a certain amount of culture. Or, I’d go to a small Irish or English village, just to absorb the feeling of life in a very small community! Mhh, there’s so many places I want to go! I would definitely go to Paris, because it’s just amazing. But London or Australia would be awesome as well. Or maybe Bora-Bora because who wouldn’t want to go there? It’s a tropical paradise! I would run away to a small Lake Community where everyone knows and cares for each other. Back to another time in history! Key West,Fl! Laid back, margaritas in hand & your book! Heaven. I would only run as far as the NJ shore. I have loved it since I was a small child and run there in my mind every chance I get. I love to watch the ocean and feel the sand under my feet, the salt air on my skin, feel the LIFE contained within that venue. I would go somewhere in Ireland. To have the opportunity to just get caught in the rain with the sound of some fabulous accents. I’d run away to the Nantucket…..love the ocean up there and the beautiful beaches. It is paradise! My runaway destination would have to be a small town on a beach. I love early morning walks on the beach with seagulls being my only companions and the lull of the ocean to rock me to sleep at night. England, Scotland, somewhere there is a lot of castles…. I would go to Alaska. Boy can one hide out there. It is expansive and sparsley populated. I would sit and look at the scenery, the lakes, the animals and contemplate my life. Of course, I would have to have my best friend along with me. His name is King, my German Shepherd!